He's 200 years older when he visits Craig and takes part in Closing Time's episode. Therefore he's already done all that waving to Amy and Rory through history. The above might answer your question. Ok. Thanks for sharing that. I'm even more confused now then, because the Doctor in the long coat is 200 years old but so is the one in the short tweed jacket (because he's wearing the tweed one when he dies in Utah). Judging by the outdated and irrelevant episode description, I wouldn't put too much attention on the cast which is probably a sum of all the main characters in the new series. The Cybermen aren’t in it for that long really, but it’s longer than they were in A Good Man Goes to War Will Matt Smith ever get a fair fight against old enemies? “I am through saving them.” Human race? Tick tock, goes the clock, and what now shall we play... Nursey rythmes again? He seemed so happy, but so sad at the same time. descrition of the doctor? Before I go, I'd like to know why I have to die? The Doctor or maybe even river? Sorry but this picture has actually made me go into meltdown!! Like The Lodger, It’s a more of a fun episode with some very funny lines. But there are also couple of good scares. Cyber's then? The Cybermen aren’t in it for that long really, but it’s longer than they were in A Good Man Goes to War Shame really,be good to see what the real Cybers can do. 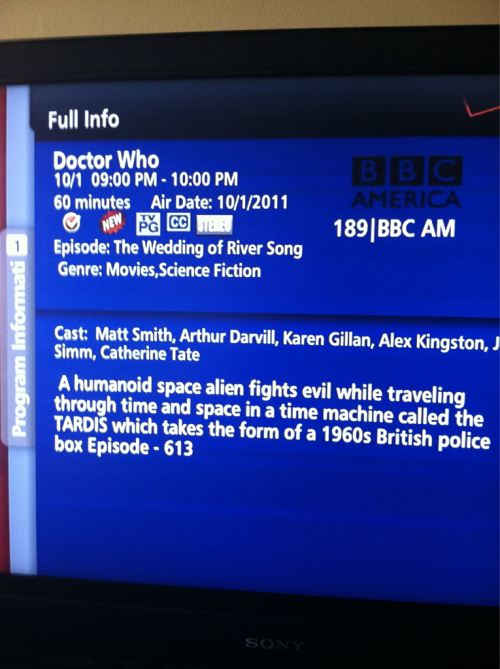 Karen Gillan and Arthur Darvill are still in the opening credits. Just saying Appearance at the end? The Cybermen are peeping toms! With the cybermat? The Doctor is in love with Craig and he really wants him to know it Kiss. Kiss. “I am through saving them.” Doctor towards the end excepting his fate? The Doctor – Here to help Well, shop assisstant or maybe something more. Craig is a pervert He filmed the Doctor's run from the shower in Lodger? Meet Stormageddon, the Doctor’s new best friend Some random awesome toy? For the girl who’s tired of waiting Gift for Amy? The Doctor can speak the ancient language of baby More baby talk? Well I wonder what mini Corden wants to say. A familiar plot solution saves the day. Sonic to the rescue! Or love. The last few scenes are very, very exciting and another big question is finally answered. Who's the astronaut? Due to spoiler below. Last 10 minutes reveal the Astronaut, is emotional and features a few Silents underwater (lake Silencio)? Someone doesn't want to do it and the Silents home? I thought maybe he was a cowboy on his way to a gunfight. Reflection on Doctor's death from Amy Rory or River? Silence will fall when the question is asked. The question is asked? We we always coming for you. Amy and Rory to the Doctor? It's a story - and this is where it begins. Kovarian obviously. But is she talking to someone important? According to some accounts, it's the day the Doctor dies. But accoding to others he survives? Doctor Song, how clever you are. She saves the day? It's time. Closing time that is. Tick tock, goes the clock, and what now shall we play...Kids involved. Hey, I'm the Doctor, I was here to help. Someone's plan wasnt what it seemed then. He seemed so happy, but so sad at the same time. Another reflection on the Doctor? You never really escaped us, Melody Pond... River changed back to being brain-washed? Tick tock, and all too soon, your love will surely die Metaphorical love or the person? Before I go, I'd like to know why I have to die? Doctor speaks, possibly the question? All those times I've heard those words, I never realised it was my silence...everyone has a different question? That would be a very evil red herring. I'm a complete Dr Who noob. I've watched all the episodes but didn't really pay attention to all the in depth story lines and stuff, just watched for the fighting of monsters really. Anyway, having watched the episode on Saturday, does this mean it's the end of Rory and Amy??? more to be announced at 8am tomorrow (if use twitter http://twitter.com/#!/bbcdoctorwho for the updates) "timescales can be rewritten!" I just like how Auntie Mabel is in the next episode. The Radio Times has previewed the Series 6 finale, The Wedding of River Song, and provided some very interesting and barmy new story information. It sounds bonkers. “Something’s happened to time,” spots Winnie. It’s as if “all of history is happening at once”. The time is two minutes past five and the date is 22 April; so it has been for as long as anyone can remember. Can the Lord of Time sort things out, or did he cause the problem in the first place? It necessarily leads us back to the events of The Impossible Astronaut and the Doctor’s demise at Lake Silencio in Utah, but this shocking moment acts as a pivot, not a dead end, for Moffat’s finale and a barrage of bewildering and bizarre imagery that spools forth. Does anyone have any ideas on this, especially the bits in bold?